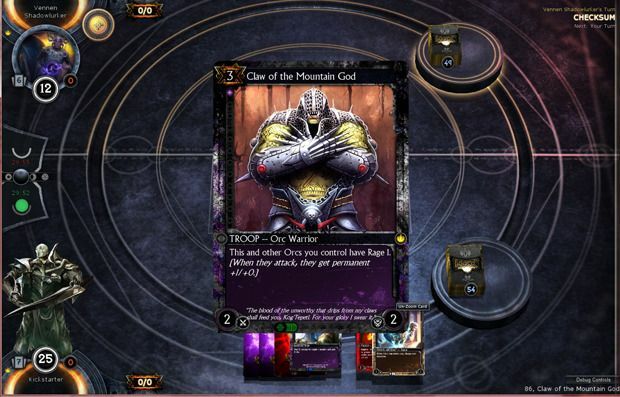 Known for its collectible card and board game business, Cryptozoic Entertainment put its latest creation, a free-to-play digital collectible card game named HEX, up on Kickstarter with an initial goal of $300,000. As of today, with 17 days left to go in the full fund raising time period, the project has garnered over $970,000. That’s a pretty good pledge amount right there. HEX is being billed as an massively multiplayer online (MMO) trading card game for Mac and PC, with the deep strategic game play of a collectible card game mashed up with the social and roleplaying aspects of an MMO, all on your Mac, with dungeons, quests, story lines, advanced AI, and–of course–beautifully illustrated card decks to collect, purchase, and use to claim dominion over your opponents. The folks at Cryptozoic know about trading card games, and they’re bringing all that experience in the genre to a free-to-play digital game, with both the deep core strategy that veterans of games like Magic: The Gathering and Cryptozoic’s own World Of Warcraft Trading Card Game expect from a new offering and a tutorial system and approachability for new players to both the genre as well as this specific game. In addition, you’ll get to create your own heroic character with stats that will affect the card gameplay, as well as a strong player versus environment experience like something out of World of Warcraft (WoW). In fact, one of the original WoW designers, Kevin Jordan, is the lead for the MMO elements of HEX. Wow! MMO vets will appreciate stuff like dungeons, raids, loot, community guilds, auction houses, and the like. To find out more about HEX: Shards of Fate, head on over to the Kickstarter page to get all the details, see the Kickstarter video, and the like. It’s only a $10 pledge to get access to the beta, and a $20 pledge will get you that, plus some starter and booster decks to play in the final release of the game. While the HEX project has reached many of its stretch goals already, like a deck editor, extra game boards, and a crafting system, there are still more stretch goals to go. If you like collectible card gaming, this looks like a fantastic way to play one from a company that really knows what it’s doing.